I really like using up the last of the yogurt container by slipping the contents into a smoothie, a parfait, or a muffin/cake mix. Last summer, I opened a large container of vanilla yogurt and as I pulled back the lid, I found a recipe for delicious muffins that included a bit of yogurt in the recipe. After making the first batch of the muffins, I knew that I would use yogurt to substitute for some of the added fat in many of my treasured recipes. The yogurt helps to moisten and lighten up the cake’s consistency and is certainly a healthier alternative to sour cream or added oil/butter. 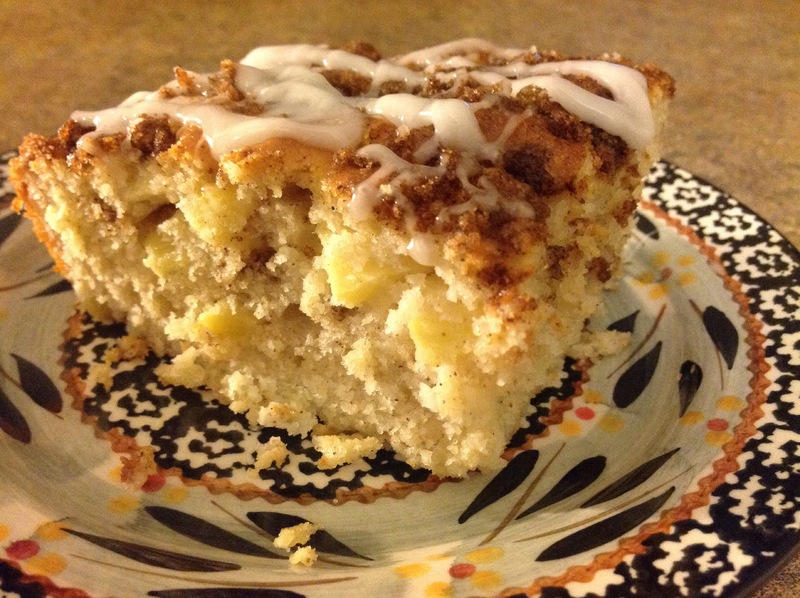 This coffee cake recipe is a perfect example. Omitting sour cream and adding apples to the original recipe makes for a flavorful moist morning treat. In fact, enjoy this comfort food anytime. Add a piping hot cup of tea or coffee and a good book…and you will be set for a lazy winter weekend afternoon. Preheat oven to 350 degrees. Lightly spray with cooking spray, a 9×13″ baking pan. Mix together the yogurt, oil, lemon juice, sugar, eggs, and vanilla in a large bowl. Fold in chopped apples. In a separate bowl, mix together flour, baking powder, baking soda, salt, nutmeg, and 1/2 teaspoon cinnamon. Stir into liquid ingredients just until no lumps remain. In a small bowl, mix the remaining 2 teaspoons cinnamon with the brown sugar and butter. Pour half of the batter into the cake pan. Sprinkle the batter with half of the cinnamon-brown sugar mixture. Spread the rest of the batter over top, and sprinkle with the remaining cinnamon-brown sugar mixture. Bake for 45 to 55 minutes, cool before cutting cake. It’s really quite delicious, Joanna…In the summer, when pears and peaches are in season, I have substituted in other fruit for the apples. It’s really a great little recipe. Thanks for your comment. Have a great day! Oh, it is! This coffee cake is really moist and flavorful…simple too! Use any flavor yogurt you like. I have added cherry, peach, tropical fruit flavors…it’s all good! Such a good idea. I’m always tempted to use natural as that tends to be my favourite for eating but flavoured one could be great. Thanks! You are welcome! Let me know how it turns out. Thanks for your valued comment…have a great day! You won’t believe it, Linda, I don’t have much of a repertoire when it comes to baking but I do make choc chip and banana muffins on a semi-regular basis. The other day when I was making them I didn’t have quite enough milk – so I added some plain yogurt. What’s the saying “necessity is the mother of invention”. I had no idea how they would turn out, but I have to say they were the most moist muffins I’ve ever made. I’ll be using yoghurt in the recipe from now on. And then, here is your great post about that very thing. I will definitely be trying this scrumptious recipe of yours with my new-found baking confidence! He! he! How wonderful, Dani! It takes a while to feel comfortable enough to change up recipes but you are right, out of necessity, you changed things up for the better. It has been my experience that it’s usually OK to substitute add ins like raisins, chocolate chips, nuts, etc. Even different flavored extracts can really change the taste of a recipe. But I am a little apprehensive with other ingredients. Sometimes a change brings you a better product and apparently that’s what happened in your kitchen with your muffin recipe. Awesome! Is it a cake? A cinnamon roll? An apple tart? All three rolled into one delicious dessert. I can’t wait to try your lovely recipe, Linda. It’s a doozie! As it sits for a few days, the flavor of the apple and cinnamon intensify and the cake becomes a bit more moist and dense. Yum! My hubby is travelling a lot this Spring.. I will make him this cake for his next trip, and pack it in single servings. It’s nice to know it will just get better after a few days in the carry-on. 🙂 Thanks! What a nice treat! He will certainly be reminded of your delicious home cooking and he will miss his adorable little family waiting for him at home. Let me know how it turns out of you give it a try…it’s a keeper! Thanks for your comment and thanks for stopping by! I tried this last night and it was fabulous as promised! I borrowed the recipe and placed it on my own blog (with credit given where credit due!!) Thanks for another great recipe. How nice that you enjoyed the recipe! Thanks for your comment and for plugging my blog. Looking forward to checking out your site…Have a great day! I like recipes with yogurt, this looks so delicious! Yogurt is an awesome alternative, isn’t it? It really adds a layer of flavor and texture! Use any flavored yogurt you like to change up the recipe a bit. Have a great day and thanks for stopping by.